Best Dell Laptops under 40000 in India - Shop for a wide range of Dell business laptops, ultrabooks and mobile workstations designed for performance and security from flipkart. Select from handpicked Dell Laptops offers under 40000. Choose Processor, Screen Size, Operating System, Graphics Memory, Ram according to your requirement. Purchase dell laptops under 40000 online from flipkart at deep discounts. Dell’, a company, doesn’t need any introduction. Almost each and every month, the USA based company launches new computing devices. Whether it is a flagship grade gaming machine or budget device, Dell has always nailed the segment. As a result, we have too many choices of laptops in the budget line up, specifically, under Rs 40,000. So, we bring you Top 10 best Dell laptops available under Rs 40,000 in India with some exciting offers, deals and discounts. The device comes with a very decent processor, good RAM and many more features but is still priced under Rs 40,000, and precisely Rs 38,100 on Flipkart.com. The device comes with a bundled offer on the online portal. Please check the deals and offers below. The Dell Inspiron 15 5575 is powered by an AMD Ryzen 3 processor, which is a dual-core SoC clocked at 2.4GHz and can go upto 3.4GHz via Turbo Boost technology. The device comes with 4GB DDR4 RAM, and one can easily upgrade the RAM memory via expansion slot available inside the device. The device is made out of plastic but do not feel cheap in hand. However, the the laptop weighs 2.2 Kg, which is very bulky and feels heavy to carry. Although, the device carries a 1TB hard disk drive in it , which is claimed to be clocked at 5400RPM. One of the main aspect is the Windows operating system on laptop, and it seems this time Dell is able to pull it out within budget segment, and you need not worry about the OS. Furthermore, the device comes with a 15.6-inch display and, additionally, the laptop comes with MS Office pre-installed. The crispy user interface is handled by AMD’s own integrated graphics card, and sadly no dedicated graphics card option is available with the device. The Dell Vostro 3478 can be considered as an excellent package at the price of Rs 38,990, and the device is available on Flipkart.com. And you can avail some exciting offers with the device as well, do check the offers mentioned below. Dell's Vostro is an outstanding series amongst another arrangement of best gadget accessible in the market. Thus, we have Dell Vostro 14 3478 with industry-driving Intel Core i5 8th generation processor. Also, for beyond any doubt, quick memory accessing is a pro here as Vostro 3478 accompanies 4GB DDR4 RAM alongside 6MB of cache memory. The showcase of the workstation displays a 14-inch of HD goals, which is actually has a 1366 x 768 pixel resolution. In spite of the fact that it appears the workstation can win everyone’s hearts with a dedicated 2GB of graphics card from AMD, technically AMD Radeon 520, which can deal with every graphics related work rich smooth. Many might consider this as one negative part of this gadget, which is its Linux operating system. Linux is a great OS yet not easy to understand by any means. Thus, a user needs to introduce Windows operating system remotely. In general, the gadget is quite great as per its cost. The Inspiron series includes several good laptops, and the Dell 5567 is one of the best laptops under Rs 40,000. Specifically, the device costs Rs 36,083 and is available on Flipkart.com. The computing device comes with exciting offers which are mentioned below. Well, the third laptop on the list is Dell Inspiron 5567, which packs an Intel Core i3 processor at the core. The SoC is a 6th generation built and clocked at 2GHz, and the inbuilt 3MB cache memory manages to pull-out maximum speed. The primary memory is handled by 4GB DDR4 RAM, and the secondary storage is taken care of by a 1TB HDD for the ample amount of data storage. The screen resolution of 1920 X 1080 pixels of FHD display is so immersing that it keeps up excellent viewing edges. Although, following these highlights, the workstation can bear four long hours of battery backup, which implies a typical utilization. One major disadvantage is its hefty 2.36 kg of weight, which is too much for a portable workstation. And, the device does not feature Windows 10 OS pre-installed. This is one of our favourite picks out of the rest, the kind of specifications this device comes bundled with, is really worth more than what one would wish for. The device is priced at Rs 33,000 on Flipkart.com, where Mastercard is providing some extra discount offers on the device. For more info, please check the details mentioned at the offer section. As we are discussing the rundown of best HP PCs under Rs 40,000, Dell Inspiron 5570 could be outstanding amongst other choices. The registering gadget accompanies 15.6-inch of FHD anti-glare display, which keeps up good viewing angles. The gadget sports an 8GB DDR4 RAM, and the 1TB of optional storage is all that could possibly be needed for keeping all that anyone could need to store. The gadget is powered by an Intel Core i5 processor, which is an eighth-gen CPU and clocked at 1.6 GHz with Turbo Boost Up to 3.4 GHz. Furthermore, the 6MB cache memory manages to boost the data access speed as compared to the previous generation. The workstation accompanies Windows 10 Home and MS office, which enables you to utilize the gadget immediately with no other installations related to the operating system. Subsequent to including such huge numbers of determinations, the gadget still weighs just 2.2kg. As we are on the midway of the best Dell laptops under Rs 40,000, things are getting better. The Dell Inspiron 3467 packs a decent specification, and is available on Flipkart.com. The device costs Rs 31,037, and comes with Mastercard offers to get the device at the best price. Check the Flipkart offer zone mentioned below for more information. Inspiron series doesn’t need any introduction, and the crazy laptops that come under the Inspiron roof are very accurately priced. The Dell Inspiron 3467 comes with Intel Core i3 processor, which is a 7th generation built and clocked at 2.4GHz. The memory part is handled by a 4GB DDR4 of RAM and the storage part is handled by 1TB of hard disk drive with a rotation speed of 5400RPM. This device is truly blessed as the combination of a good processor and better RAM creates a buttery smooth performance. Inspiron 3467 flaunts a 14-inch HD display with a resolution of 1366 X 768 pixels. Like every other budget device, this one also comes without a Windows operating system, and the users need to install the system software by themselves. In terms of power, the device is fueled by a 4-cell battery, which is able to power the device for up to 4 hours. Overall the laptop is very good. Flipkart is one of those few companies, which proved their devotion towards excellent customer service each and every time, and they never let down the expectations of their consumers as well. How could they forget to bring exciting discount offers this time? If you are looking to purchase these laptops via Flipkart.com, you can get 10% instant discount on your first purchase through your Mastercard. The device comes with an overall decent package and is priced at Rs 26,500 on Amazon.in. The device comes with several offers. Please check the offers, and terms and conditions at the end. The Dell Vostro 3568 A553111UIN9 is powered by an Intel Core i3 processor, which is a 6th generation built. Yes, technically, the processor is two generations older but the power it generates is more than enough for decent performance. The laptop comes with 4GB of RAM to handle fast memory accessing and the 1TB of secondary storage to ensure unstoppable media storage. However, the laptop is made out of plastic but is able to achieve a pretty good design. The device comes with a 15.6-inch HD display, but one disappointing aspect is the Linux operating system, and one needs to install GUI operating system by themselves. The complete package comes with a lithium-ion battery, which is claimed to fuel up the device for roughly 3-4 hours. The laptop weighs approximately 2.5kg, which makes the device big and bulky. The Dell vostro 3468 comes with a combination of good processor and massive storage but still priced at Rs 26,990 on Amazon.in. The device comes with several offers, please check them at the end of the article. Dell Vostro 3468 is a mid-range computing device featuring an Intel Core i3 7th generation processor, which is claimed to be clocked at 2.4GHz. The device features a 4GB of DDR4 RAM and a 1TB hard disk drive, which has a rotational speed of 5400RPM. The display part is dealt with by a 15.6-inch HD screen, and the coordinated Intel HD 520 graphics with the SoC go about as a cherry over the cake. The device comes with Ubuntu pre-installed and not Windows 10, which is a major drawback. The power area is taken care of by a 4-cell battery, which can give a reinforcement of 4-hours on a single charge to the laptop. The Dell Vostro 3567 might look a little bit old as compared to other devices, but believe us the device still can generate ample amount of power to handle all necessary tasks on the go. The device is priced at Rs 30,730 on Amazon.in. Are you looking for a computing device, which can handle your official tasks and you don’t want to spend a hefty amount on the same? 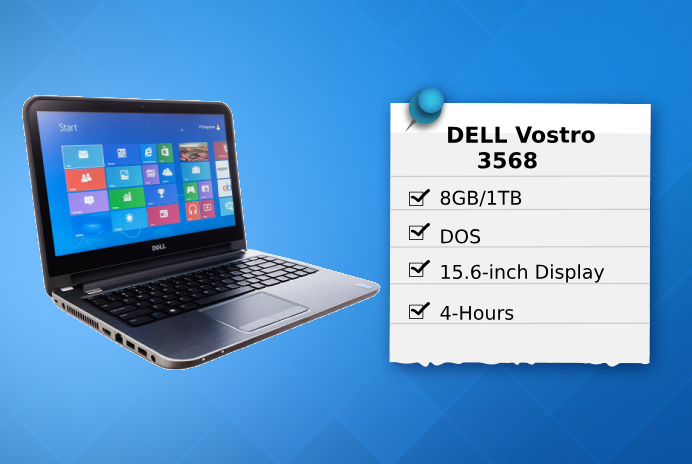 The DELL VOSTRO 3567 may be the ideal choice for you. The gadget accompanies Intel Core i3 6th generation processor, which is clocked at 2GHz and combined with 3MB of L3 cache memory for quicker memory access. The device sports a 4GB DDR4 RAM and 1TB of HDD, particularly the RAM memory can be expanded by means of memory slots. As the workstation is made for performance generation, the gadget does accompany Windows 10 pre-installed. The device also comes with MS office pre-installed for smooth flow of work for executives. As far as the power is concerned, the processing gadget includes a lithium-ion battery, which can provide enough juice to the laptop to last up to 4 hours. Regarding the display, the PC has a 15.6-inch 720p display, which is an anti-glare screen and can give you nice viewing angles under bright conditions also. The Dell 3565 is an AMD-powered laptop that comes with a decent overall package, and is priced at Rs 22,450 on Amazon.in. The price of the device is definitely one of the major reasons to make this laptop an absolute worth buy device under Rs 40,000. The laptop comes with exchange offer up to Rs 10,001 off. For more Terms and Conditions, please check the details mentioned at the end of the article. Two years of extended warranty at Rs 2,699 after a discount of 4%. DELL 3565 goes with an AMD E2-9000 in the engine, which is a seventh generation chipset, and wears integrated graphics for smooth UI execution. In addition, the device packs in a massive 1-terabyte of secondary storage, and for the snappy data accessing, a 4GB DDR4 RAM is set inside the workstation. The blend of a respectable processor and the tremendous memory helps users in getting a rich and smooth work experience. At the showcase front, the PC has a 15.6-inch HD screen to give immersive user interface. The screen, also, incorporates an anti-glare display, to improve the viewing angles on the gadget. As per the association, the machine can last up to 4-hours on a single charge, which is furthermore awesome. The workstation accompanies Windows 10 preinstalled, thus, one can immediately begin dealing with the machine. Generally speaking, the gadget could be a tolerable decision. The laptop is priced at Rs 33,590 on Amazon.in and is available at a additional discount of Rs 10,001 with exchange offer. The exchanging process needs some rules to follow, please check the same at the end of the article. Two years of extended warranty at Rs 3,999 after a discount of 40%. One year of extended warranty at Rs 2,299 on a discount of 42%. In spite of the fact that the Dell Inspiron 3567 has been specified previously, yet this one is a move up to the past age. The gadget is fueled by an Intel Core i3 processor, which is a seventh generation chipset that runs at 2.3GHz. The gadget is accompanied by a 4GB DDR4 RAM yet one can undoubtedly redesign the RAM memory by means of expansion slots accessible under the hood. The gadget is made out of plastic, yet it doesn't feel shabby close by. Be that as it may, the workstation is weighing at 2.5 kg, which is extremely cumbersome and feels substantial to carry. On another aspects, the gadget is conveying one 1TB hard disk drive in it, which is asserted to be clocked at 5400RPM. One of the principle viewpoints is Windows operating system on the workstation, and it appears this time Dell can haul it out inside spending portion, and you needn't bother with the stress over OS. Besides, the gadget accompanies a 15.6-inch display, and moreover, the PC accompanies MS Office pre-introduced. The fresh UI is taken care of by Intel's very own HD 620 integrated graphics card, and sadly no dedicated graphics card option is accessible with the gadget. The devices are available on Amazon.in, and you can avail these best laptops under Rs 40,000 with an exclusive discount of up to Rs 10,001 on exchanging your old laptop.